Our 3M6000 series half-face respirator is the most popular respiratory protection in the frac industry. The respirator is designed to work with the lightweight P100 pancake filters to filter out over 99% of airborne particulate in non-IDLH environments. Fit testing is required to meet OSHA compliant respiratory protection programs. Add the 3M 6000 Half Face Mask to your cart here. Add P100 3M2901 Filter for half mask to your cart here. 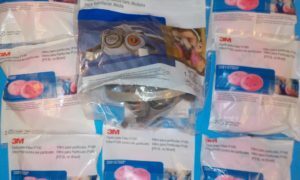 Respirator and filters are available in San Antonio at The Eagleford Store and for shipping. For large respirator orders email us. The Eagleford.Store is a service of Eagle Ford Training San Antonio to help equip South Texas oilfield workers with the safety equipment PPE that they need to stay safe in the oil and gas industry.